Chicory is a caffeine-free herb that is a popular coffee substitute. You will see chicory most often in New Orleans Coffee (or 'chicory coffee') recipes and it can be brewed and enjoyed on its own for its dark, rich flavor. If you want to enjoy a coffee-like experience without turning to decaf, chicory is one of your best options. 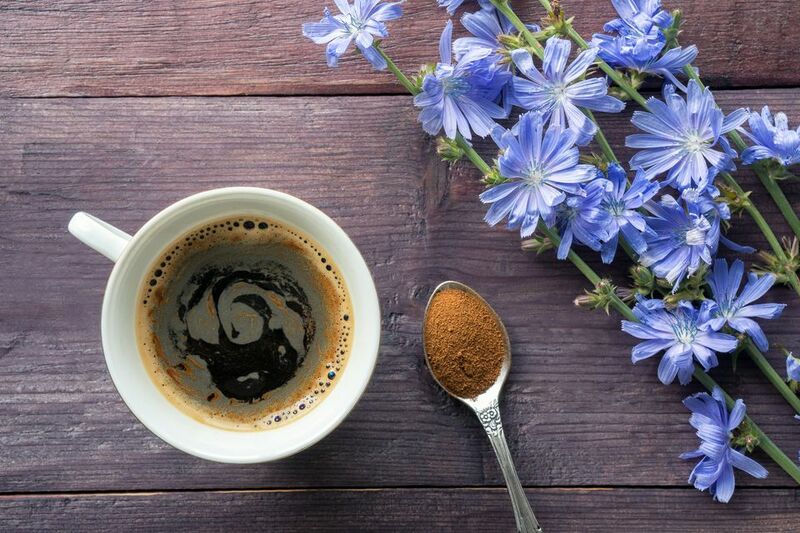 The flavor is very similar to regular coffee and because chicory naturally contains no caffeine, it appeals to a healthier, all-natural lifestyle. The chicory plant (Cichorium intybus), is a hardy perennial with purplish-blue flowers that open and close at the exact same time each day. It is common in North America and Europe. Chicory is often misidentified, misspelled, or known by other names. Cichorium intybus is distinct from Cichorium endivia, which is also known as endive, frisée, escarole, or radicchio. Chicory is also known as chicory root, chicory plant, Cichorium intybus, curly endive, and succory. The flowers and leaves may be used in salads and flavored vinegars. They are also used in healing tonics in some parts of the world. Each chicory plant has a single, long, thick root (known as a 'tap root'). Chicory root is roasted before it is brewed, but it can also be boiled and eaten like a vegetable. Chicory is one of the oldest recorded types of plants. It is native to Northern Africa, Western Asia, and Europe, and its cultivation is thought to have originated in Egypt in ancient times. Later, chicory was grown by Medieval monks in Europe and at the same time, it was commonly added to coffee by the Dutch. It was brought to North America in the 1700s and has been a popular coffee substitute or ingredient in coffee in France since around 1800. More recently, chicory consumption has been associated with embargoes and cost-cutting. Across history, many substitutes have been used when coffee was unavailable - including roasted acorns, yams, and a variety of local grains - yet chicory tends to be the preferred coffee substitute. In some circles, it is even used when coffee is available and cheap. One historical and cultural example of chicory's use as a coffee substitute is found in New Orleans. Due in part to its influences from French culture, New Orleans was a major consumer of coffee prior to the Civil War. Then, in 1840, coffee importation to the New Orleans harbor was blocked. Taking a cue from their French roots, locals began to use chicory instead. Today, chicory remains popular in New Orleans, and 'New Orleans Coffee' typically refers to chicory coffee. New Orleans coffee vendors often blend their coffee with up to 30% chicory root. For cost-cutting reasons (and perhaps for safety concerns) chicory is also used as a coffee substitute in many U.S. prisons. To make chicory root into an edible (or, technically, potable) substance, the root is pulled up from the ground, washed, dried, roasted, finely cut, and then steeped or brewed. The process gives chicory a roasted flavor roughly akin to that of coffee and this its primary appeal in drinks. After chicory root is roasted and cut up (or, as some say, 'ground,' though this is technically incorrect), it is ready to be steeped or brewed. Chicory is more water soluble than coffee, which means you need to use a lot less of it when brewing it with or instead of coffee. Since chicory is usually much cheaper than coffee, this substitute is great if you're on a tight budget. Over-brewing chicory will definitely place you in the anti-chicory camp, so be careful not to use too much or you will ruin the flavor. Begin with 1/2 teaspoon of chicory for every cup you brew and adjust according to your personal taste. There are many ways to enjoy chicory in your drinks. To brew basic chicory coffee, use about 2/3 ground coffee and 1/3 chicory. Brew as you normally would in a drip coffee maker, a French press, or your favorite method. Enjoy chicory on its own by brewing it as you would any other coffee but begin with at least half the grounds. Add spices like cinnamon, cloves, nutmeg or star anise for more flavor. New Orleans Cafe Noir - Enjoy this popular recipe for New Orleans-style black coffee. New Orleans Cafe au Lait - If you prefer, add lightly scalded or steamed milk. You can also use chicory to add a coffee flavor to various foods. Chicory is generally thought to be healthy. It is naturally caffeine-free and if you're having issues with a caffeine addiction or caffeine overdose, then drinking chicory can be a good way to reduce caffeine intake or eliminate it your diet. Chicory is also reported to kill intestinal parasites (or act as a vermifuge), cleanse the blood, and improve liver health. At the same time, some people have found that too much chicory can cause stomach problems. Ease into your introduction to chicory and, just like coffee, try not to drink too much at one time to avoid this.